First there were blood diamonds from the Congo. Then blood rubies from Burma. Could blood cashews from Vietnam be next? That's one implication of a new Human Rights Watch (HRW) report that claims cashew nuts and other Vietnamese exports are produced by drug addicts detained in forced-labor camps across the country. Those who refuse to work are beaten with truncheons, given electric shocks, locked in isolation, deprived of food and water, and obliged to work even longer hours, the report says. Joseph Amon, director of the New York Citybased organization's health and human-rights division, says what's happening at the centers "constitutes torture under international law." Titled The Rehab Archipelago, the report could potentially embarrass foreign companies doing business in Vietnam. The country is the world's largest exporter of processed cashews and the U.S.'s top supplier of the nut. China and the European Union are also major buyers. Some 40,000 people are detained at the country's 123 drug-rehabilitation centers. Most must perform so-called labor therapy, which can involve sewing garments, making bricks or  most commonly  processing cashews. "If cashew importers want to ensure that their supply chains are not tainted with forced labor and abuse, they need to very closely scrutinize where they source their products," says Amon. HRW's investigation has already compelled two companies  one Swiss, one American  to do just that. The Lausanne-based firm Vestergaard Frandsen terminated its relationship with five Vietnamese subcontractors after learning that thousands of its mosquito bed nets had been produced by drug detainees. "We take labor issues very seriously and would never condone nor accept what has happened," Vestergaard Frandsen said in a statement. "To us, even one bed net made under these conditions is one too many." Meanwhile, Oregon's Columbia Sportswear Co. cut its ties to a Vietnamese factory after HRW alerted the firm that the factory had subcontracted work to a nearby drug-detention center without permission. "Involuntary labor of any kind violates our written contracts and policies and also our values," says Peter Bragdon, senior vice president of legal and corporate affairs at Columbia Sportswear. "We do not and will not tolerate it." 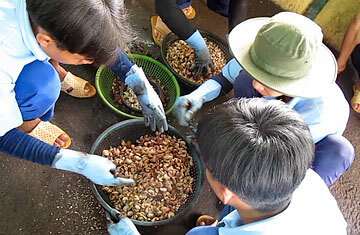 For Vietnam's drug detainees  mostly young men battling heroin addiction  cashew processing is hardly therapeutic. They spend six to 10 hours a day husking and skinning nuts. It is drab and unhealthy work: cashew oil is caustic and burns the skin. "I would sometimes inhale the dust from the skins, and that would make me cough," one man told HRW. "If the fluid from the hard outer husk got on your hands, it made a burn." For their labor, detainees are paid nothing or a few dollars a month. Even this pittance is whittled away, says HRW, since some centers charge detainees for food, lodging and what they term "managerial fees." Vietnam's system of drug-detention centers has dramatically expanded over the past decade. There are now 123 centers nationwide, up from 56 in the year 2000, according to the report. Drug users are usually detained for two years on the authority of police and local officials, with no judicial oversight. HRW interviewed 34 people recently detained in 14 of 16 centers administered by the Ho Chi Minh City authorities. None had seen a lawyer, judge or court before or during their detention. When those two years are up, the same officials and the center's director can  and usually do  confine them for a further two or three years for "postrehabilitation management." One former detainee tried to escape after his two-year detention had been extended by another three years. He was captured, beaten and shocked with an electric baton. Women and children are also confined: boys of 16 or 17 "were beaten the same as adults," a former detainee told HRW. The U.S. Embassy in Hanoi acknowledged "forced labor by convicted prisoners and drug users" in a 2008 diplomatic cable published by WikiLeaks. "The practice is not widespread, however, and represents an insignificant portion (less than 0.3 percent) of Vietnam's cashew industry," says the cable. But the practice could be more widespread than U.S. officials believe. The embassy cable refers only to the cultivation of cashew trees. It doesn't include cashew processing, which is done in 11 of the 16 centers run by Ho Chi Minh City authorities and in at least four centers in the cashew-producing province of Binh Phuoc, say former detainees interviewed by HRW. Nor does the cable account for the fact that Vietnam imports far more cashews than it grows. In 2011, it will import 450,000 metric tons of raw cashews, mostly from Africa, estimates the Vietnam Cashew Association (VINACAS). VINACAS members have never used drug detainees as laborers, insists Dang Hoang Giang, the association's secretary-general. "Vietnam is the world's largest cashew-nut exporter, and some people don't like that," he says. "Thus false allegations are made to harm our reputation." Giang invited the foreign media to witness how Vietnamese companies processed their nuts. "Nowadays factories use all kinds of modern machines. There's not much room for manual labor." The government has yet to respond to the report. Nguyen Van Minh, the Vietnamese official who heads the Department of Social Evils Prevention, told TIME he had drafted a letter in response to the report but could not talk to the media until it was approved by the central government. Whatever the response, one fact is harder to deny: Vietnam's detention centers are terrible at rehabilitating drug addicts. Relapse rates are "officially between 70% and 80%, but most regard 95% as being closer to the real situation," reported the World Health Organization in 2009. Substitution therapy with a prescription drug like methadone is the most effective way to treat heroin addiction. But none of those interviewed by HRW received "any form of scientifically or medically appropriate drug dependency treatment," says the report. Methadone programs will certainly improve relapse rates, but they won't stop forced labor, says Amon, not while drug-detention centers profit from it. "The solution to heroin use is methadone," he says. "The solution to the centers is to close them down." Read "Cambodia: Making Heroin Addicts Use Herbal Remedy."